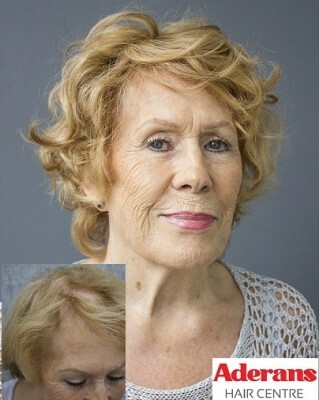 Thinning hair is becoming more and more common in women these days. Genetic hair loss is the only hair loss in which the hair follicle gradually gets smaller and produce finer hair until it stops altogether and it’s at this moment thinning occur. Signs of thinning hair can be hugely upsetting. Hair often thins because it is fine-textured or because of the use of too many harsh chemicals which can cause it to easily break. Hair loss can also be inherited from a parent or could be as a result of a stressful period. Some have thinning hair all over, some see the centre part gradually widen, whilst others will develop a more distinct baldness at the crown of the head. Whatever your hair loss requirement we can help you achieve those good hair days back again! During a consultation (which we never charge for) our hair loss consultant will show you the best Aderans option available to solve your specific hair loss requirements. Please refer to our consultation process to find out more. TO THE TOP or back to Female Hair Loss , Female Pattern Baldness , Alopecia Areata , Telogen Effluvium , Traction Alopecia , Scarring Alopecia , Trichotillomania , Hypothyroidism , Monilethrix , Lupus , Iron Deficiency Anaemia , Cancer Treatment, Polycystic Ovarian Syndrome , Scalp Skin Conditions or Excessive Styling .